Residential and office construction is booming around the new Berlin Brandenburg Airport in Schönefeld. Sonnenhöfe GmbH & Co. KG, a joint venture of EYEMAXX and DIE Deutsche Immobilien Entwicklungs AG, has hired ZÜBLIN as general contractor for the turnkey construction of 18 four- to five-storey buildings in Neu-Schönefeld. The € 85 million contract also includes the construction of two underground car parks. The plot to be built upon covers approx. 51,100 m2 in the centre of Neu-Schönefeld north of the future Berlin Brandenburg Airport. ZÜBLIN Subdivision Nord will begin work on the site in February 2018. Overall completion is scheduled for August 2021. Sonnenhöfe was designed by BLUMERS ARCHITEKTEN of Berlin. The project foresees the construction of 16 buildings with 559 rental apartments of one to four rooms each with a total living space of about 38,000 m2. The apartment houses will be grouped around three green courtyards with quiet areas and playgrounds. In addition to the residential buildings, ZÜBLIN will also build two office complexes with a total of about 10,730 m2 of usable space. The offices will be located to the west of Sonnenhöfe and will serve the adjacent buildings as noise protection. Smaller commercial space will also be available in the ground floor of several of the apartment buildings. 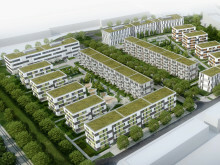 ZÜBLIN and DIE Deutsche Immobilien Entwicklungs AG are already working together on the Theodor-Fontane-Höfe project, also in Neu-Schönefeld. With Sonnenhöfe, ZÜBLIN has now secured itself a follow-up contract. “We are delighted by our client’s trust in the partnership to lead another demanding project to success,” says Jens Quade, technical subdivision manager at ZÜBLIN Nord. The plot for Theodor-Fontane-Höfe is also situated to the north of Berlin Brandenburg Airport. There, ZÜBLIN is building an ensemble of twelve multi-family units with a total of 334 apartments, one underground car park with approx. 145 parking spaces, and about 190 outside parking spaces. The project consists of three identical courtyard ensembles with four buildings each, connected by an underground car park. The contract has a value of € 41 million. The apartments at Theodor-Fontane-Höfe are to be ready for occupancy by the end of 2019. ZÜBLIN is realising Sonnenhöfe and Theodor-Fontane-Höfe as a general contractor under its teamconcept partnering scheme. The arrangement puts a focus on the early inclusion of all project participants. In both cases, ZÜBLIN applied its know-how already during the design phase of the projects. The early coordination and the transparency afforded by the binding teamconcept framework make it possible to accelerate certain processes and to recognise optimisation potential in advance. With its teamconcept, the company offers a range of services that covers all construction-related tasks – from project planning to design and execution to the smooth start of building operations. STRABAG SE is a European-based technology group for construction services, a leader in innovation and financial strength. Our services span all areas of the construction industry and cover the entire construction value chain. We create added value for our clients by our specialised entities integrating the most diverse services and assuming responsibility for them. We bring together people, materials and machinery at the right place and at the right time in order to realise even complex construction projects – on schedule, of the highest quality and at the best price. The hard work and dedication of our close to 72,000 employees allow us to generate an annual output volume of about € 14 billion. At the same time, a dense network of numerous subsidiaries in many European countries and, also, on other continents is helping to expand our area of operation far beyond the borders of Austria and Germany. More information is available at www.strabag.com. By the end of 2021, STRABAG subsidiary ZÜBLIN will complete 18 buildings as part of the Sonnenhöfe im Sternenviertel project.